With technology at full speed ahead, many workout programs have gone digital. While technology has been great in advancing our health and fitness regimens, there are many tools that have been around for a long time, and are the tried-and-true way of getting results. 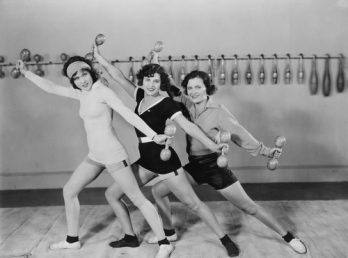 From weights to jump ropes and beyond, we’re going old school to give you the scoop on fitness gear that works as hard as you do. We all know that weight training is a good way to build muscle and tone up, but lifting weights is good for more than just making you look good. Lifting weights helps to improve bone density, keep joints mobile and can help relieve depression and anxiety. You can pick up weights at all big-box and sport retailers and they won’t break the bank. You can look online and even consider looking on Pinterest to get ideas for weight lifting workouts. The best part is, you can squeeze in daily free weight workout without leaving the house. Not just for the kids, jumping rope is a lightning fast way to burn calories and stay in shape. In 10 minute jump rope exercises you can burn more than 100 calories and you’ll also sculpt your shoulders, chest, arms and legs. If you haven’t jumped rope since the playground, there are a few tips you should know for choosing the right rope. Jump ropes come weighted and in all shapes and sizes. Go with whatever weight, thickness, etc. you want but to make sure you get the right length, place one foot in the center of the jump rope and make sure handles hover slightly below (not above!) your armpits. Another good trick is that when you first get started, use the rope to get going and if it gets too difficult, you can still jump in place without the rope to take a quick break while still burning calories. The age-old Eastern practice of yoga has been a top wellness and workout choice for years, as it combines meditation with physical fitness. Pilates incorporates many of the same philosophies, as Joseph Pilates was a yoga enthusiast and incorporated many of the same teachings in his development of Pilates in the early 1900s. Both are low on cardio and big on strength training and both focus on breathing techniques. Yoga and Pilates can lower stress levels and decrease blood pressure, which improves lung capacity, increases flexibility and helps maintain healthy weights. Whether you sign up for group yoga or Pilates classes or prefer online fitness videos so you can workout at home, yoga and Pilates have long lasting physical and mental benefits. This weighted ball has been around since ancient Greek times and still proves to be a great strength training tool. Training with a medicine ball improves health and helps power muscles and increase speed. Portable and versatile, medicine ball exercises can be done solo or with a partner. Whatever you choose, medicine balls help to improve coordination and help tone, build and firm muscles and joints you never knew you had. For training, choose a ball weight that is challenging, but not too heavy. Focus on movement and coordination rather than just lifting the ball. Medicine ball workouts can be found online or ask your local gym trainer to show you some moves.